Over the years, it became clear to The Texas Department of Public Safety and Texas Department of Licensing and Regulation that Texas parents and teens needed an alternative to costly, inconvenient, traditional driver education schools and driving instructors. The Online Driving Professor provides that alternative. We offer a state-approved, low-cost, high quality, online parent-taught driver education course which allows Texas Teens to learn state-required driver education and parent-taught in-car driving lessons at their own pace. Why Choose Parent-Taught Driver Education? Once a student completes the first six (6) hours of our driver education course and secures their Texas Learner License, the parent-instructor can begin teaching the 14 hours of state-required in-car observation and practice lessons. While a traditional classroom course and driving instructor may be the best choice for some, it’s not for everyone. Parent-Taught In-Car Driver Education Lessons from The Online Driving Professor offer the following benefits. * Comprehensive lessons: Our parent-taught in-car driving lessons are organized, comprehensive, and easy to follow. We organize the 14 hours of state required in-car observation and practice lessons into 12 lessons. These downloadable lessons include comprehensive instruction guides for the parent-instructor, easy to follow behind-the-wheel lesson guides and checklists, and valuable behind-the-wheel student assessments. * Peace of mind: Parents know their teen best. Parent-taught in-car driving lessons puts the parent in control of teaching their teen safe driving practices. This allows the parent to provide instruction and coaching tailored to the needs and learning style of their teen. * Convenience: Rather than being bound to a driving instructor’s availability, a parent and teen can schedule behind-the-wheel lessons whenever they want. Parents don’t have to worry about transporting their teen to and from instructor lessons. And – student drivers can learn in a comfortable environment without other student drivers in the car. * Affordability: Unlike driving schools and instructor-taught driving lessons that cost hundreds of dollars, our complete course is available for $75, making it a superior, affordable alternative to traditional driving schools. Why Choose Online Driving Professor? Fast, Flexible Learning! 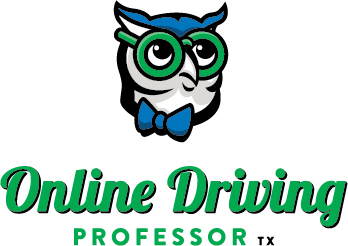 Online Driving Professor is dedicated to providing Texas Teens with a fun, affordable driver education course to help Texas Teens become responsible, safe drivers. We strive to use the latest technology and most current information on Texas driving laws, regulations, and driving statistics to offer Texas Teens the most comprehensive and up-to-date Texas Teen driver education course. Our goal is to provide Texas Teens a learning environment that is engaging, easy to navigate, and convenient for the busy lives of teenagers and parents. Our course is approved by the Texas Department of Licensing and Regulation and has an A+ Rating with The Better Business Bureau. Our Texas Teen Parent Taught Teen Driver Education course fulfills the 44 hours of state-required driver education for teens, ages 14 – 17, seeking to obtain their Texas Learner License and Texas Provisional Driver License. The course includes study guides, practice tests, checklists, and interactive media designed with students in mind. In addition to satisfying state driver education requirements, our course also includes the Official State of Texas Driving Knowledge Test at no additional cost, providing convenience to the student and parent by avoiding having to take the written exam at a Texas DPS Driver License Office. The Driver Education Completion Certificates (DE-964) are emailed to students and parents immediately after they are earned, and are stored on the student’s dashboard to download at their convenience. Call our Texas-based Customer Support Team today at 888-526-1925 to learn more about our online Texas Parent-Taught Teen Driver Education course. Or- sign-up today and get started! In just a few days a Texas Teen can earn their Texas Learner License and start our parent-taught in-car student observation and driving lessons.